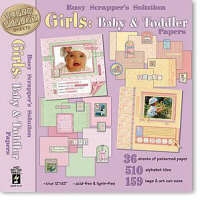 For the girls—from baby to toddler pages! Darling girl-themed papers, borders, tags, alphabet tiles and more are perfectly coordinated and designed especially for the busy scrapper. This collection includes papers and art cut-outs to help you scrapbook those memories from babyhood through the toddler years. You’ll find delicate patterns for baby girl photos and cheerful bright colors for toddlers. Collection includes 36 sheets of paper, including 28 patterned sheets, 510 alphabet tile cut-outs (in four different styles) and 159 tags and art cut-outs designed to coordinate perfectly with the patterned papers. All papers are true 12x12.